As always I can promise you there are ABSOLUTELY NO SPOILERS in this review! "Boston Gangster. Brother of politician. FBI informant. Murderer. Whitey Bulger." Jonny Depp is back to his best and there isn't a black pearl or never-ending gobstopper in sight! It's hard to believe that the leading man with so much acting talent is something of an albatross around most studio bosses necks. It wasn't until he started impersonating Keith Richards on the seven seas that box office doors were blown wide open. 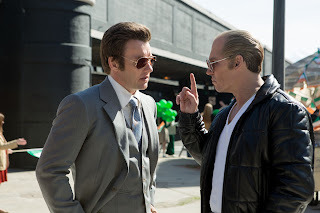 So it is with great joy I can report that this gangster movie is neither cliche nor a catastrophe for "Jonah" Depp. 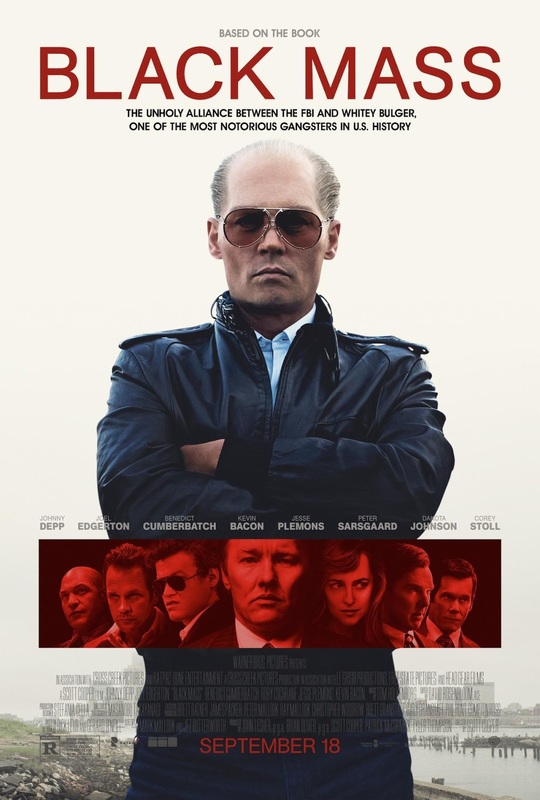 Small time Boston gangster, Whitey Bulger (Depp), brother of a high ranking politician (Cumberbatch), forms an alliance with the FBI (Edgerton) and quickly becomes a major player of the crime world. 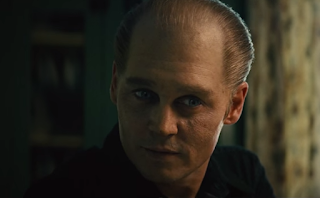 Depp's trademark good looks are cast aside for a gritty visual via prosthetics in the form of a fake nose, leathered skin and white hair. James "Whitey" Bulger is a vial, dangerous man on a mission to rise to the top no matter who he has to step over or put a bullet through to do it. The reason this movie feels fresher than most in the Gangster ilk is while others focus on one leading man or one side of the law, here we have both. 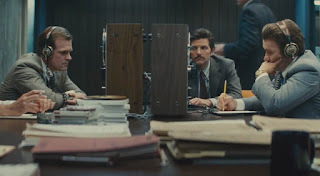 While yes Depp is the title character, Joel Edgerton's turn as FBI agent John Connoly is as much a reason to go see this film as any. Connoly is caught in this strange ill-fitting place between two worlds that sees him bending FBI rules to facilitate his unwavering loyalty to his childhood friend, Bulger. Everyone loves a true story especially when it is so outrageous it's better than fiction as is so often the way in the True Crime genre. In fact if this were a fictional script, this story would seem a little far fetched with his endless public crime spree that goes unchallenged despite his every whereabouts being tracked by the FBI. This makes us as an audience only like the film that bit more. The rest of the cast is not too shabby at all with some serious star turns in the form of Benedict Cumberbee-atch, Jesse Plemons (Friday Night Lights) and Kevin Bacon (so many films they made a game about it*). This is a good gangster movie, while it didn't absolutely blow me away it's good to see a decent Gangster movie come along. The acting is first rate as is the script, keeping it fast paced and with plenty of intrigue. Is this going to be a classic of the Gangster genre alongside Goodfellas, Casino and The Godfather, hell no! It does however see Depp come back from box office obscurity of niche character acting and Tim Burton oddities. Depp at his acting best will only every be a very, very good thing for cinema. Jonny Depp sure does love to play real life gangsters. He has starred in Donnie Branco (1997), Blow (2001) and Public Enemies (2009). Forget About ittttttt. Have your say before you go & comment below! Don't forget to sign up to this blog to have a new review emailed to your inbox. Just sign in at the bottom of the page. Never miss a review again!